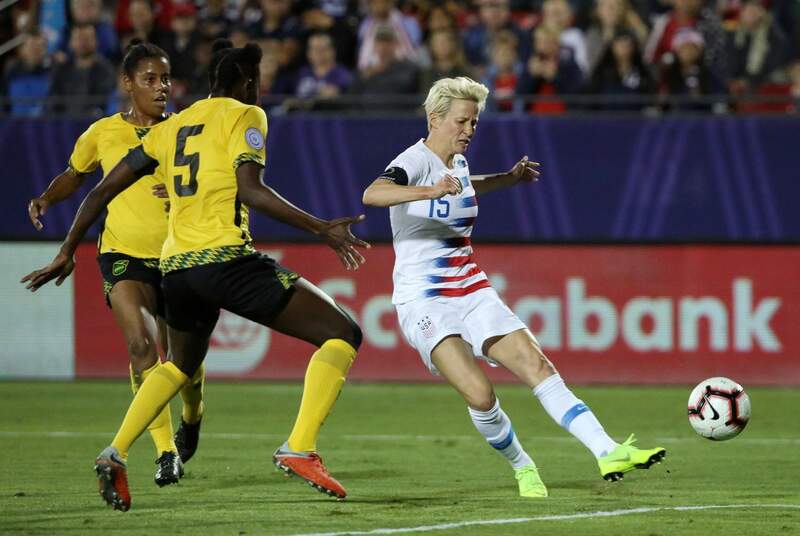 United States forward Megan Rapinoe scores a goal while being defended by Jamaica defender Konya Plummer during the first half of the CONCACAF women’s World Cup qualifying tournament on Sunday in Frisco, Texas. FRISCO, Texas – Tobin Heath and Alex Morgan each scored twice in the first half and United States earned a spot in the World Cup next summer in France with a 6-0 victory over Jamaica on Sunday in the CONCACAF qualifying tournament. Heath’s first came in the first two minutes of the match and she added a second in the 29th. Megan Rapinoe, Julie Ertz and Morgan also had first-half goals as the United States built a 5-0 lead. Morgan’s second goal was a penalty kick in the 84th minute. The top-ranked United States is the defending champion of the sport’s premier event, having won the final in the 2015 World Cup against Japan. It was the team’s third World Cup title. Canada, ranked No. 5 in the world, also clinched a spot in France with a 7-0 victory over Panama in the earlier game Sunday at Toyota Stadium. The top three finishers in the CONCACAF Women’s Championship represent the region in France, so the winners of both semifinals earned a berth before the final. The title match and the third-place game are set for Wednesday in Frisco. The fourth-place finisher will face Argentina in a playoff for a spot in France. Jamaica, ranked No. 64th in the world, was vying to become the first Caribbean nation to go to a World Cup. The Reggae Girlz upset Costa Rica 1-0 in the group stage before routing Cuba 9-0 to finish second to Canada in Group B. The island nation re-started its women’s national team program in 2014 after a six-year hiatus, boosted by the support of Bob Marley’s oldest daughter, Cedella Marley. Morgan’s goals tied her with Canada’s Adriana Leon for the tournament lead with six. Heath, who spent much of 2017 and the beginning of this year sidelined by injury, has seven goals in seven starts this year. Her second goal of the night came on a spectacular serve from Portland Thorns’ teammate Lindsay Horan. On the run, Heath smashed it past Jamaica goalkeeper Sydney Schneider. Seventeen teams have earned trips to the World Cup. There are seven teams yet to be determined.